Exposure to stress is an almost daily occurrence in the modern age. It's important to find time to rest and recover, and cannabis is a perfect ally when looking to get some quality down time. These 5 strains are particularly effective at taking the edge off of stressful days. Modern Western life comes with many comforts and luxuries, however, it can also keep many of us in a constant state of stress. Work deadlines, schedules, bills, traffic. All of these factors, and others, keep the sympathetic nervous system engaged, keeping the body and mind in fight or flight mode. This physiological response evolved to keep us alive, but in modern times, it is triggered by sources of anxiety that are not legitimate threats. The hormonal cascade caused by this response can become detrimental over time. Therefore, it’s critical to find ways to bring about the relaxation response, activating the parasympathetic nervous system and calming the body down. There are a variety of ways to activate the relaxation response. Many people find relief in meditation, yoga, hiking, and exercise. Smoking weed is also a good choice for some people for relaxing both the body and the mind. Indica strains are particularly calming, and are associated with a soothing and sedating high. However, sativa strains can also help to ease stress by inducing creative flows and taking your mind off the busyness of the day to come. In general, cannabis is a great herbal aid for quality sleep, the lack of which can contribute to stress. These five strains are ideal choices when looking to wind down at the end of the day. OG Kush is one of the most famous cannabis strains in existence, and it has earned its popularity. The deeply stoning variety sits firmly on the pantheon of heavy indica strains. This queen of the cannabis world was born out of the crossbreeding of Chemdawg, Lemon Thai, and Pakistani Kush. This mix of prime genetics results in a strain that features 75% indica genetics and THC levels of approximately 19%. Her tall and slender flowers induce a high that melts the muscles and evaporates stress. It can be hard to properly relax after a long and stressful day. A few hits of this beauty in a vape or bong will make this process a lot easier. Your eyes will begin to feel heavy just minutes after inhalation, and it won’t take long to feel a strong appetite arise. 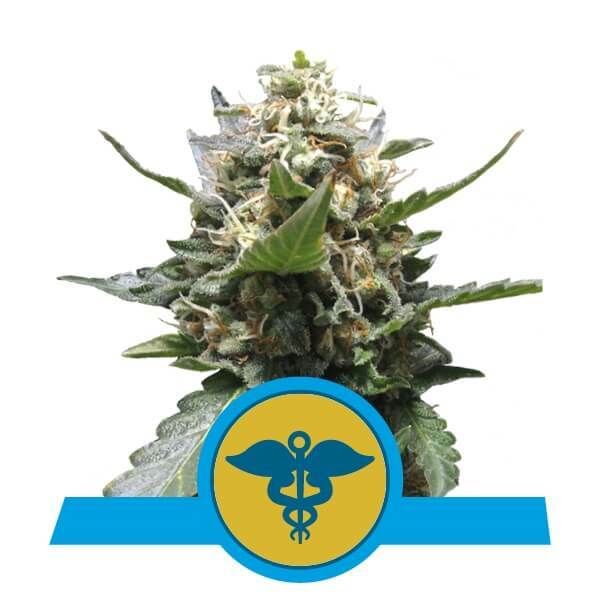 This therapeutic high is delivered along with tastes and aromas of citrus, pine, and fruit. If you fancy cultivating your own supply of this relaxing variety, OG Kush can be grown well both indoors and out. Indoor plants grow to heights of between 90–160cm and put out yields of 425–475g/m². Plants cultivated outdoors in the elements grow to taller heights of 180–220cm and produce yields of 500–550g/plant. OG Kush has a flowering period of 7–9 weeks. Royal Dwarf is proof that size is not always better. This little rocket grows incredibly fast and provides moderate yields of flowers that offer a subtle, calming, and clear-headed high. Royal Dwarf produces small flowers with a stunning dark green shade. The trichomes upon these buds provide a psychoactive resin with THC values of 13%. These levels produce a high that is far from overpowering, but still offers an effective experience. The sativa dominance of this strain targets the head, stimulating ideas and creative thoughts and plunging the mind into the present moment. This award-winning lady is the perfect smoke right after walking through the door after a hard day of work. The clear-headed nature of this high allows users to smoke whilst still being able to functionally complete evening tasks such as laundry, cooking, and washing up. 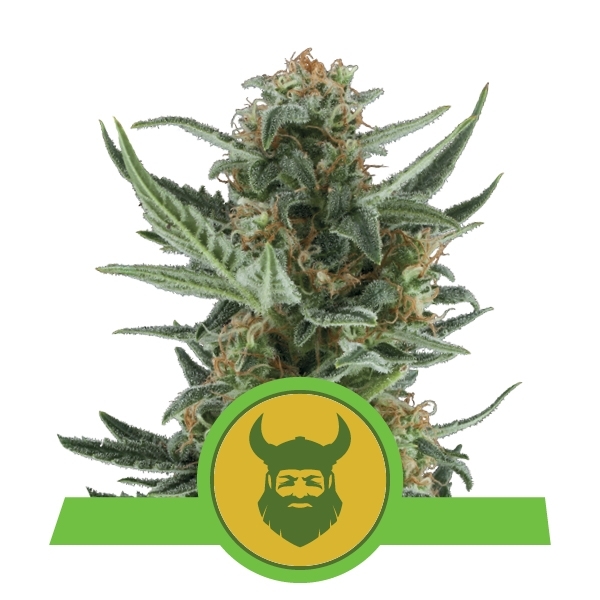 Royal Dwarf is an ideal strain for growers with minimal space, and those wanting to keep their operation private. She maintains miniature heights of between 40–70cm indoors and 50–90cm outdoors. Such small heights mean she is the ultimate strain for guerrilla growing operations, and is highly unlikely to be discovered before harvest time comes around. Indoor plants will provide yields of between 150–200g/m². Plants cultivated outdoors will produce modest yields of between 30–80g/plant. As her name suggests, Royal Medic provides a plethora of therapeutic effects. She was bred specifically to produce equal levels of both CBD and THC, offering smokers good levels of two therapeutic cannabinoids. CBD is a non-psychoactive cannabinoid that offers a variety of relaxing effects due to its potent anti-anxiety and pain soothing effects. The THC levels within this strain hover around 10%, providing a subtle high that allows users to stay lucid and clear-headed. The effect from smoking these flowers is subtle in its psychoactivity, yet extremely relaxing. The genetic makeup of Royal Medic is primarily sativa, allowing users to keep the mind relatively active during the evening hours, and enabling them to get on with personal tasks and projects. The high has a gentle and relaxing body effect that keeps the user calm and ever so slightly stoned. Royal Medic offers good yields of medicinal flowers. Plants grown indoors under good-quality lights will produce between 425–475g/m² and grow to heights of between 80–120cm. Plants grown outdoors under sunlight produce great yields of 475–525g/plant and grow to taller heights of 120–150cm. Expect to be harvesting after a flowering time of 9 weeks, or during early October if growing outdoors. Blue Cheese is a genetic collision featuring some of the tastiest parent strains around. One of her parents, Cheese, is a world-renowned hybrid that emanates powerful scents of cheese and earth. Her other parent, Blueberry, produces terpenes that release scents of ripe fruits and berries. The combination of these two sensory powerhouses has produced a slightly sativa-dominant strain that overrides the senses with lush smells and tastes. Nothing eases the stress of a rough day quite like a soothing indica high coupled with such outstanding flavour. The high from these flowers is fuelled by a THC value of 19%, stoning and relaxing the body with ease. Medium CBD levels contribute to an overall sense of wellness. Blue Cheese performs well in both the grow room and the garden. Indoor yields clock in at between 500–550g/m² and plants achieve varying heights of 100–160cm. Outdoor plants cultivated within garden beds and pots put out yields of up to 550g/plant and max out at heights of 200cm. Blue Cheese features a flowering time of 7–8 weeks, with outdoor plants ready to harvest during late-September. Medical Mass is another cannabis strain that has been specifically bred to produce large quantities of CBD. She was created using the stellar genetics of parent strains Critical Mass and an unknown CBD-rich variety. The aim with this strain was to create a plant that produces equal levels of both CBD and THC. At a ratio of 1:1, Medical Mass enables smokers to enjoy the benefits that both these cannabinoids have to offer. This ratio is perfect for the evening, especially when the goal is to tackle stress. The high itself is balanced with 60% indica genetics and 40% sativa genetics culminating in both mental and physical effects. THC levels of 10% provide a light and underlying stoning effect coupled with the awareness-enhancing effects of CBD. This pleasant high is delivered alongside contrasting tastes and smells of sweetness and spice. Medical Mass will not disappoint when harvest time comes around, yielding well both indoors and outdoors. Indoor plants produce yields of around 500–550g/m² and grow to easily manageable heights of 60–100cm. Plants grown outdoors provide harvests of approximately 525g/plant and grow to heights of up to 150cm. Expect harvest to come around after a period of 7–8 weeks.